Shipping to Canada: We charge and collect for shipping only. Taxes, Duties and border fees as well as any other related charges are customer’s responsibility. Key Machine, Keys and Safes: Due to the heavy weight of some of these products and our internet software not being able to determine where they will ship from (many come directly from the manufacturer and different warehouses throughut USA) we reserve the right to make changes to shipping method and (or) prices. We will always contact you prior to any additional charges. Whenever we offer free shipping, product will be sent by UPS or Fed-Ex ground,. Discontinued items can NOT be returned. Upon receipt of merchandise inspect product carefully, should you find that the product does not meet your expectations, or satisfaction, contact us immediately and tell us your concerns, so we may make every effort to satisfy your purchase. 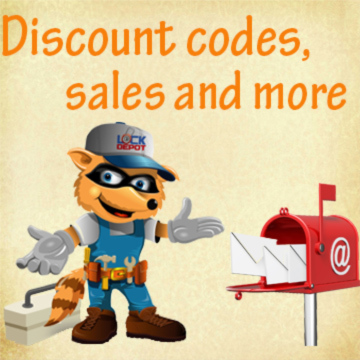 We will not accept any returns on locksmith tools, any items listed as discontinued, special order items, or items held for more then 14 days. Obviously we will exchange any item which was delivered defective or in the rare instance of shipping the wrong product. We will accept stock items returned within 14 days of receiving it - MUST be in new condition, Installed units are not considered new condition. subject to a 35% restocking fee. We will accept defective returns within the manufacturer's warranty period if sold by Lock Depot. The customer is responsible for all shipping charges related to returns. You will receive an RMA# before you return any goods to us, the RMA# must appear on your return packing label. Merchandise without an RMA will be refused, and no credit will be issued. RMA's are valid for ten(10) days from date of issuance. Locksmith Tools, Software, High Security Locks, High Security Cylinders, Key Machines, Keys, Safes, Factory Orders. We will not accept back any hardware that has been installed.